Vietnam and Cambodia have agreed to continue their mutual support and close collaboration in order to strengthen the “good neighborliness, traditional friendship and comprehensive, sustainable and long-term cooperation” between the two countries, thus bringing pragmatic interests to their people. The agreement was made on June 15 by President Tran Dai Quang and Cambodian King Norodom Sihamoni in Phnom Penh during Quang’s two-day state visit to Cambodia. 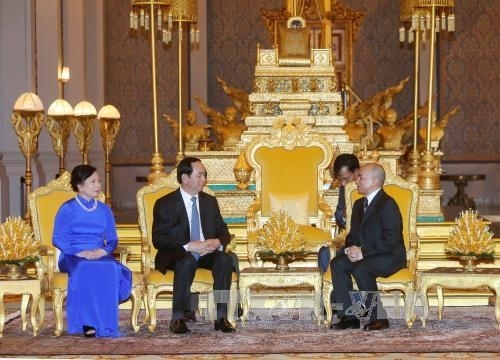 The Vietnamese President expressed his hope that King Norodom Sihamoni would continue to help Vietnamese in Cambodia stabilize their lives and make more contributions to the development of the host country as well as to bilateral ties. Vietnam always wishes to work together with Cambodia to consolidate and further develop the bilateral fruitful friendship and cooperation, for the sake of the two countries’ people and for peace, stability and development in the region and the world at large, Quang said. The Cambodian King described the visit as a milestone in deepening the friendship and comprehensive cooperation in a sustainable manner. In a meeting between President Quang and Cambodian Prime Minister Hun Sen, the two leaders committed to fully realizing commitments to contribute to peace, stability and development in the region and the world. They agreed to direct their ministries and agencies to work closely with one another to fine-tune relevant mechanisms and agreement to push forward trade, investment, economic connectivity, education-training and tourism.